This list will be edited and added to as more audio sources are found. The summaries for the items are from the descriptions by the person who uploaded them. A description by early Christians of the death of St. Polycarp, Bishop of Smyrna (now Izmir, Turkey), in about AD 155. Includes a classic explanation of why a martyr's remains were important, and relates martyrdom to the Eucharistic liturgy. On his way to martyrdom in Rome, Bishop Ignatius of Antioch (then in Syria; now Antakya, Turkey) wrote letters to the Church in several cities of the Empire. Seven of these letters survive. By the way, you'll notice that the good bishop is not shy about calling Jesus "God". The Epistle Of Ignatius To The Trallians Read Mar 26, 2016 by Peter-John Parisis - Shorter Version - dated 1867 - Translated by Rev. Alexander Roberts, D.D., and James Donaldson, LL.D. The Epistle Of Ignatius To The Romans Read Mar 26, 2016 by Peter-John Parisis - Shorter Version - dated 1867 - Translated by Rev. Alexander Roberts, D.D., and James Donaldson, LL.D. "The Epistle of St. Ignatius of Antioch to the Romans" Oct 11, 2005 Facing martyrdom -- okay, running toward it with open arms -- the old Syrian bishop, once a disciple of the Apostle John, still took time to write letters to the Christians in various cities. Here's the one he wrote to the Church in Rome. Fragments of Papias Read By Peter John Parisis Oct 17, 2016: Papias - he was a disciple of Jesus' disciples and wrote down everything he heard from them. These are the only writings we have left of his. The classic 2nd century study and analysis of Christian Gnosticism in all its extant variants, as collected both from Gnostic writings and discussions with Gnostic teachers (as well as ex-Gnostics). Since Irenaeus was studying Gnosticism to help others change Gnostics' minds, he strove for as much accuracy as possible in his account. And in fact, you will find that his account of Gnosticism tallies closely with that of the recently rediscovered Gnostic writings. Now that Irenaeus has given us a rundown on Gnostic teachers, beliefs, and practices, he moves to suggesting arguments against such beliefs. These arguments also provide an interesting look at theology in Irenaeus' day. He's talked about why the Gnostics are wrong about God. Now it's time for Irenaeus to talk about what the Holy Scriptures and the Holy Tradition of the Church have to say. . In this volume of Against Heresies , Irenaeus uses Jesus' statements quoted in the Gospel to argue against the Gnostics' interpretation of Jesus. He emphasizes the continuity of the Old Testament with the New, and the ways the Son made appearances or was foreshadowed in the Old Testament. (For some reason, none of my more recent audiobooks have been put into the Maria Lectrix section by the nice archive.org folks. .
Against Heresies concludes with a volume on the meaning of Jesus' teachings and Paul's epistles, refuting the rather farfetched readings of the Gnostics. There's plenty of interesting information on the stuff that early Christians did believe, too! . In this chapter Tille takes on the notion that the ancient pagan German religions were somehow solar based. The chapter is worth reading on its own simply because the false claims Tille rebuts are expressed today in the same language and same reasoning. The only difference between the arguments then and now is that the names of the originators of this anachronistic mess have been nearly forgotten. The primary scholars responsible for inventing and promoting these false ideas are Jacob Grimm (1785-1863), Heino Pfannenschmid (1828-1906) [the work], Hermann Grotefend (1845-1931)[the work], Karl Weinhold (1823-1901), and Ulrich Jahn (1861-1900) [the work]. Tille then reviews the seasonal relationship arguments and the textual evidence regarding the adoption of terms for the Summer Solstice. This required close contact with the Romans as well as the inventing of new terms for the Solstice in the various German dialects. Tille then documents the adoption of solar terms in the Anglo-Frisian dialects and others, demonstrating that the new terms for solstice were only used of the summer solstice and only after long term, close contact with Rome and the Church. But with respect to the regular use of terms for the equinoxes they do not appear in the German dialects until after the Church is educating the laity about how Easter should be calculated. The last portion of the chapter is dedicated to debunking the notion that the German peoples were a sun-worshipping people. He turns to the names of Germanic deities and the adoption of the Roman god day-names and the problems these present. The general acceptance of the Roman quarter days probably did not take place until after the eleventh century. There is no record of them before this time. Yet there is not a shadow of historical evidence for these fancies. The Germanics neither had a festival about Christmas nor about the day of John Baptist. The Twelve-nights, of which he talks a little further on, are simply the Dodekahemeron of the old Church, which existed there for centuries before they appeared among any Germanic tribe. Nay, all through the Middle Ages the term Sonnenwende, or solstice, has not a single time been shown to have been applied to December 25 : its use is absolutely restricted to June 24, just as the word solsticium was among the Romans. Tille points out the problems with Weinhold’s interpretation of Bede’s comments on Ostara and Hreda. Then he turns to Weinhold’s great fiction in his Weihnacht-Spiele und Lieder aus Süddeutschland, rebuking Ulrich Jahn’s uncritical acceptance of Weinhold and his furtherance of “unhistorical speculations” about the so-called pre-Christian times. This last bit begins on the bottom of page 79 and finishes on page 80. The current notions about solar worship in pagan Germany are recent innovations, not history. Tille begins this chapter by challenging the “opinion [that] Michaelmas is an older term and festival than Martinmas” which was advanced by Professor Karl Weinhold. Along with this theory of precedence Weinhold asserted that the traditions around Michaelmas were transferred to Martinmas. Tille argues from Weinholds evidence that Weinhold interpreted his data backward, and points out the Weinhold gives no evidence for the claim about the transference of traditions. Tille demonstrates that Martinmas was actually the first of the two Holy Days established in the Germanic areas. And while Tille’s reference to just these documents would be adequate to resolve the issue, Tille produces dozens of quotations from period documents, enlisting liturgical practices, cannon law, economic law, tax law, lease law, and agriculture— citing the shift from pasturing to the development of the cultivation of meadows in the Carolingian age and its effects upon the timing of annual economic law and practice. Indeed, while modern Neopagans project harvest festivals into the eras prior to Christian influence among the ancient Germanic and Celtic peoples, it is precisely this agricultural/economic shift which generates the ability of these peoples to have a significant, regular and planned harvest: and hence, some sort of regular festival surrounding harvests. Tille’s evidence and line of reasoning would also apply to the modern anachronistic projection of Samhain as a harvest festival upon the early Celts. The change in agrarian/pastoral practice allowed for the wintering of more herd animals, giving rise to later and later “slaughter day” celebrations. The focus of this chapter is on how the evidence speaks about at dual division of the year. Several significant points regarding this division were already brought forward in the preceding chapter. Tille turns to the seasonal liturgical expressions of the churches found in the church Councils, Synods, and Canon Law. The documents bear witness to an overt changing of the calendar from a Germanic dual division toward a Roman liturgical division based more on quarters of years. Also, documents like the 578 Synod of Auxerre seem to show that the Church began to schedule meetings annual for priests at these same two time periods of mid-May and of abbots at the beginning of November. Again, the main text provides the thread of the argument and the footnotes contain the texts to which he refers. This particular section contains many valuable references to the development of the Advent Season, the establishment of All Saints’ Day, and Rogation Days. Tille suggests that the “Church sanctified the older Germanic celebrations of mid-May and mid-November by special litanies, so it took over the meetings wont to be held at those terms.” (p. 55) But it could also be that the Church took advantage of the common meeting times because it was simply easier, travel, room, and board were already in place and there was not a conflict with other major church festivals. If we might look at a current day example: today several church bodies schedule seasonal meetings in Las Vegas during certain times of the year, not because they are taking over or sanctifying those seasonal festivals celebrated by the natives of Las Vegas, but simply because it is more convenient and more economical to hold their meetings at this time. 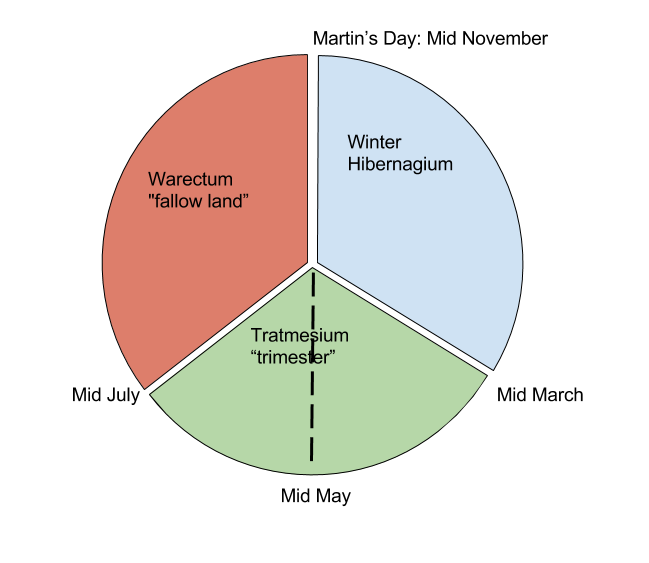 Based on Tille’s presentation of his research we can see that the oldest “Yule Tide” had nothing to do with Christmas, but based on the beginning of both the tri-partition and dual partition of the Germanic year such a festival was during what we would call the first part of November: a season significantly removed from Christmas. Chapters IV and V are a fuller exposition of the medieval textual evidence for the briefer presentation and assertions Tille made in the first chapter about the Tri-Partition and Dual Division of the Germanic year. The data presented cover the early 7th century through the 18th century. They consist of Anglo-Saxon Laws, Germanic institutes, tax documents, duty regulations, Saxon land charters, contracts, liturgical texts, church circular letters, agricultural records, lease documents, and more. The geographic spread of the evidence reaches from Germany through regions settled by Germanic peoples during this millennium even into Spain and Scotland. The reason there is no Germanic textual data presented from earlier is that such data does not exist or remains yet undiscovered. The layout of the evidence is parallel to the three main claims listed in the first chapter. The main text of the chapter lays out the thread of the argument. This argument is fortified with 50 or so quotations from various source documents from the period and regions in the footnotes. The quotations also show evidence of a dual division of the year, which Tille brings out where relevant. The first part of the chapter deals with documents demonstrating that Martinmas was the end of the economic year: tax day, lease day, contract for employment day, election to public office, etc. Tille turns then to the tri-partition of the year. Evidence includes scheduling of law court: scheduled mid-November, mid-March, and mid-July. Church taxes and duties, such the Rome-feoh, a British name for the tax imposed by the Church of Rome also called the “Peter’s penny”, some of which were required three times a year. Tille discusses the Thing-tides and their close relation to these three main German seasons. He also traces the gradual imposition of the Julian calendar upon these festivals. We should note that the evidence Tille presents also demonstrates that while there was a general three-fold division of the year there is a lack of uniformity between the various regions as to when these divisions could be mapped to the Julian calendar. Tille again emphasized that the texts show no evidence of solar calendaring, there are no quarter days nor, Tille advances, is there any “trace of sun-worship whatever in Germanic religion.” (p. 45) This also he relates to the Scandinavian year. This chapter begins Tille’s efforts to give what he believes to be evidence that there are traditions from an ancient Germanic mid-November New Year feast that have become absorbed by the later but proximate Church festival of Martinmas. that Germanics termed the year with respect to either three seasonal divisions or two main divisions. that Germanics observed the three seasonal divisions with respect to their economic and legal activities. that none of the evidence shows that ancient Germanics were concerned with single lunar/month divisions of the year. that Germanics modified the use of Roman month names to fit a pattern that is more neatly described as a three-score-day period. that Germanic month/three-score-day periods did not line up neatly with the beginnings of the Julian months. that there is no evidence of yearly festivals synchronized with solar events such as solstices or equinoctes. that there is no evidence of a mid-winter festival at all. that in general the period that was called by words relating to “Yule” or “winter” mainly began mid-November. All this is to highlight the fact that there is no surviving documentary evidence of an ancient Germanic twelve day long midwinter festival beginning at the solstice and which included the burning of a large log for the duration. This is not to say that ancient Germanics did not observe a festival in the period of “Yule” or the beginning of “winter” prior to or even concurrent with the spread of Christianity. It is also not to say that there could be no possible traditions or rituals of such a festival enduring after the Christianization of these peoples. Tille draws from Caesar’s Bellum Gallicum and Tacitus Annales that the Germanic peoples held a festival in mid-November, consistent with the conclusions of the first three chapters. The bit from Tacitus (Annales 1:44-51) is a specific mention of a German feast at the beginning of winter as the occasion of Germanicus’ 14 B.C. punishment of mutineering Germans in the Marsi villages (the area of modern Düsseldorf). Their winter camp was 60 miles away north at Castra Vetera (modern Xanten in Wesel, where the St. Viktor monastery and cathedral would be established in the 13th century). The seasonal references (1:44, 45, 47) match those of Caesar for time just preceding winter. there were two routes, he deliberated whether he should pursue the short and ordinary route, or that which was more difficult unexplored, and consequently unguarded by the enemy. He chose the longer way, [no mention of snow] and hurried on every remaining preparation, for his scouts had brought word that among the Germans it was a night of festivity, with games, and one of their grand banquets. [festam eam Germanis noctem ac sollemnibus epulis ludicram.] Caecina had orders to advance with some light cohorts, and to clear away any obstructions from the woods. The legions followed at a moderate interval. They were helped by a night of bright starlight [no mention of moonlight as in 1:28], reached the villages of the Marsi, and threw their pickets round the enemy, who even then were stretched on beds or at their tables, without the least fear, or any sentries before their camp, so complete was their carelessness and disorder; and of war indeed there was no apprehension. Peace it certainly was not - merely the languid and heedless ease of half-intoxicated people. So let us understand Tacitus as relating that the Germans of the Rhine valley in the time of Germanicus had customarily (if not annually)[sollemnibus] held a feast just at the general time that winter is beginning. The word sollemnis is in some contexts used with the meaning annual. In this context the meaning of solemnity/reverence would seem a bit ironic (which might be the intent). But perhaps the meaning of customary fits well. There is, however, no real description of the religion or ritual involved beyond it being a drunken festival. The next surviving historical mention of western Germans feasting in mid-November comes in the 6th century. By this time St. Martin’s Day (November 11th) had become a popular Church festival. Tille’s argument is that several aspects of western Germanic feasting at St. Martins are vestigial of the festival mentioned by Tacitus. In the opening chapter Tille presents what is claimed as known about the native structuring of the Germanic year from Jacob Grimm, Karl Weinhold, Hermann Grotefend, and Heino Pfannenschmid contrasting these views with the actual known textual records from Tacitus through the close of the 18th century. unde annum quoque ipsum non in totidem digerunt species: hiems et ver et aestas intellectum ac vocabula habent, autumni perinde nomen ac bona ignorantur. Complete Works of Tacitus. Tacitus. Alfred John Church. William Jackson Brodribb. Lisa Cerrato. edited for Perseus. New York. : Random House, Inc. Random House, Inc. reprinted 1942. Opera Minora. Cornelius Tacitus. Henry Furneaux. Clarendon Press. Oxford. 1900. Tille also shows that the other most common ancient Germanic expression about the year was bipartite: winter-summer. The ancient Germanic peoples also commonly wrote of the year in terms of winter v. summer, or in terms of three legal/economic periods. Examples of both usages together from the same regions and same periods are found in what are termed as “three-score-day tides” fitting a theory of a six-fold division of the year. The Roman notion of months with their individual names was adopted slowly and at different times in different regions. Records showing Germanic concern for solstices and equinoxes come into existence only after the adoption of Roman calendrical forms and Church usage. 1. Three annual non-ordered law courts held. Louis the Pious in 817 codifies already existing practice “in anno tria solummodo generalia placida” [Sohm, 398], a practice living into the 15th century. The change in terminology to suit the adoption of the Christian Liturgical calendar as well as Julian names is evident and late. 2. Records of economic history: Three annual accountings rather than four or two. Anglo-Saxon period wages were paid three times a year. Tille gives five example quotations from Thorpe’s Ancient Laws and Institutes of England. The implication for us here is that the early textual evidence would show that the ancient Germanic peoples did not leave any record to suggest that they originally followed a solar year with the solar quarters as seasons. Rather, Tille argued, the record strongly suggests that their annual reckoning was based on the “economic and climatic conditions”(16) of the geography they inhabited. In the second chapter Tille turns to the question of when the Germans considered the turning of one year to the next. First pointing out that the Germanic tribes counted their days from the evening before, citing documents from before the Christianization of the Germanic peoples: Caesar’s Bellum Gallicum VI:xvii; Tacitus Germanica xi; as well as examples after Christianity began its spread among them: Bede’s A.D. 725 De Temporum Ratione, ch. 5 de Dies cites Leviticus 22:32 showing this practice is consistent with Church practice, that of the Jews, and of ancient Israel; the 9th century Anglo-Saxon Chronicle giving many examples of the daily reckoning; and later Anglo usages such as fortnight, and the Twelve-nights of Christmas. Tille shows that they also reckoned their years by the winter beginning them: a practice also common with other cultural groups as evidenced by A.D 1st century Roman authors, Manilius’ Astronomicon, and Martial. But this stands in contrast to the Julian practice of beginning the year at the Kalends of January (January 1); also evidenced in the Anglo-Saxon Chronicle. His argument is that the previously demonstrated bi- and tri-partite Germanic divisions of the year rule out the Roman solar quartering of the year. The question then is when did the Germanic peoples consider the beginning of winter? Here the three groupings of evidence from the first chapter also come to bear. The general climates of the regions inhabited by the Germanic peoples from the Roman period and later strongly suggest early to mid-November as the beginning of winter. Gothic writings from the sixth century demonstrate that the beginning of their Iiuleis tide (beginning of winter) was nearly equal that of Roman November and December, with November being called fruma Iiuleis. A surviving Gothic calendar marks St. Andrew’s day as Fruma Iiuleis 31, in our reckoning: November 30th. Tille states that this strongly suggests that the “the Goths of the sixth century had taken over the Roman calendar, naming the Roman months by the home-made names of those Germanic tides which approximately covered them. It by no means follows from this fact that each of the Germanic pre-Roman three-score-day tides exactly covered two Roman months.”(19) Variability between Germanic month names for their Roman near equivalent shows that the beginnings of Roman months were not the same as the Germanic beginnings of tides or months. They could be half a month out of sync. So, for example, while the Goths began Iiuleis at the beginning of Roman November, the Anglo-Saxons began Geola at the start of Roman December. Suggesting that mid-November was more appropriately the approximate time when this “Yule” tide began and extended over the three-score-day tide until about January 15th. Karl Weinhold tries to maintain that Germans started the new year on St. Michael’s (September 29) which is close to the Roman solar quarter day. But Tille points out that Weinhold does this without listing any evidence. Tille resorts to a personal attack in response to Weinhold’s proposal: “Only a man who has never in his life left his study for fresh air can maintain that winter began at the close of September!” (21f) He follows this with a cutting, though not necessarily even-handed, analysis of Weinhold’s inconsistent reconstruction. In particular he will focus on Martinmas and the traditions surrounding that date in order to demonstrate that Martinmas absorbed these traditions from the old Germanic new year.